“I have always operated on two levels,” the infamous British double agent Kim Philby once said. “A personal level and a political one. When the two have come into conflict I have had to put politics first.” But such an explanation belies the hidden truth of Philby’s treacherous motivations explored in Ben Macintyre’s A Spy Among Friends; ‘Philby tasted the powerful drug of deception as a youth, and remained addicted to infidelity for the rest of his life,’ writes the author. While Philby’s motivations were originally rooted in communist ideology, it was his innate desire to burrow into the most exclusive of clubs – into a society so secret and insulated – that drove Philby’s prolonged sedition. Contrary to the nervous stutter that blotted his speech, Kim Philby was an egotist and a cold-hearted manipulator. His story sounds like fiction, and thanks to Macintyre’s fluent prose, it reads like a grand spy novel, too. Philby’s betrayal, and that of the other members of the Cambridge Five, has been recounted in several tomes. 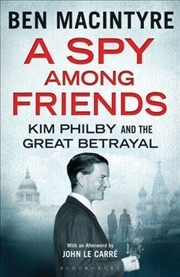 Manintyre’s version uses the prism of friendship to present the tale from a fresh perspective, focusing on another MI6 Intelligence Officer, Nicholas Elliott, who retained a strong relationship with Philby for the duration of the traitor’s career, and who never had an inkling of his compatriot’s disloyalty. It can make for uncomfortable reading. Elliott, who enjoyed a commendable career, was a staunch advocate of Philby, putting his reputation on the line on more than once occasion for the sake of his pal. The reader, benefitted by hindsight, can’t help but feel for Elliott as he protests Philby’s innocence and goes above and beyond for his friend: the turncoat’s actions on behalf of the Soviet Union lead to the deaths of hundreds of personnel. How much of that burden weighed on Elliott’s shoulders? We’ll never really know; being a typical Englishman, ably stoic, Elliott was hardly one to vent aloud. Macintyre can’t offer decisive comment on the matter, but intersperses the finale of his text with extract from various materials, leaving the reader to ultimate decide. A Spy Among Friends highlights the inherent flaws of the intelligence services – in particular the ‘old boy network that existed at the time – and examines the complexity of espionage, ultimately underlining the importance of luck and fortune that’s essential – or was, at least – to a long career. Evidence shows Philby’s treachery deeply impacted the USA’s Counterintelligence Chief of the time, James Jesus Angelton, who became increasingly untrustworthy of everyone in his ranks. Angleton took it personally – Philby was, after all, a friend; and Macintyre constantly hammers home this point: Philby’s actions had horrific consequences in terms of deathly statistics, but it was the personal betrayal that stung most, and resonates most deeply. With A Spy Among Friends, Macintyre has added another gem to his glittering collection of works and cemented his reputation as one of the most palatable historians writing today.